THANK YOU to all who have helped me in the past! Your support means so much to me, but even more to fellow Happy Rhodes fans. This is a fan page, but Happy knows about it and though she would probably rather not have some of these things heard, gives it her cringing blessing. A lot of what's here is for the Happy Rhodes completist. If you're new to Happy, unless you're here to specifically check out one of the cover versions or collaborations, you'd probably be better off at the Song Samples page. Hey, if you have a rare track/interview that's not here, I probably don't have it. PLEASE oh PLEASE write me at xenussister@TAKETHISOUTTOMAILyahoo.com (make note and change the address) and tell me about it. I'm also looking for ANY live recordings pre-1992. Anything, even partial concerts. I have nothing live from the pre-Warpaint, "1st4" or Bartlett/Rhodes era. Here are various ways to access Happy's live clips. She's never made an actual video so these are as close as you'll get. NOTE: There are now so many live clips of Happy on YouTube and MySpace that these lists are hopelessly out of date. One of these days I might get around to updating them, but these are good starting points. This page has all of Happy's YouTube live clips embedded on the page. It might take a while to load up. This page is just a list of the videos on YouTube, with direct links. Very quick load. The clips on Google Video are SUBTITLED in English with Happy's lyrics and talking. This page has all the Subtitled videos (the ones that have been done so far) embedded on the page. It might take a while to load up. There aren't all that many yet (more are coming in the future), so I haven't made a page of just the list of titles. When Happy was still involved with Aural Gratification, she contributed 6 tracks to 2 instrumental CDs, Aural Gratification I and Aural Gratification II. They’re both worth getting even without Happy. They’re out of print, but you might still find them around. Or you could try contacting Kevin Bartlett at Aural Gratification. (AURALG@aol.com) and see if he has any extras. They really are wonderful, with music by Kevin, David Torn, Bokeno, Jamie Edwards, Quiet City and, of course, Happy. This appeared on a radio-only promo (not that anyone ever played it). This is often the first song I play for people who've never heard Happy. Happy’s never released this track or even mentioned it publically. She told me that she wrote the music to a poem that her mother gave her, so none of the lyrics are hers. Someone I didn’t know and never saw again had it on Napster, and Happy hasn't a clue as to who it might have been or how he happened to have it. God I miss Napster. It appears here with her blessing. This radio version of “Roy” only appeared on a promo-only CD single sent out to radio stations. It's Happy's own remix. Many videos of live clips can be found on the Video page. Happy Rhodes live – The Chariot (not the greatest recording or version, but listen on after the song for a gut-wrenching explanation of what the song is about). Here is a VIDEO of that performance. These are all audience recordings, so please give some leeway when judging the sound quality. For QUEEN fans, 3 excellent and gorgeous versions of "Lily of the Valley" paired with Happy's song "Possessed." Happy performed this song pairing 4 times in 2 nights, but I missed getting one of the 4 (2nd night, 1st show). That version of Lily of the Valley is different from the others. It's quieter, slower, and perhaps the most beautiful of them all. The sound of that last one isn’t as good, but something very funny happens at the beginning. It’s at the same time extremely endearing, and will blow you away with just how high Happy can reach with her amazing voice. And she still goes on to sing the song with heart and feeling. See also the Left Hand Demos below for "Nevermore," her song about Freddie's passing. This is on Bob Holroyd's 2003 album Without Within. Happy Rhodes Live - Soon/Possessed (this was also an encore song, after a long clapping session, and has pre and post-song banter, then they play Happy's song "Possessed.") VIDEO of "Soon" only. See also Happy's compilation RhodeSongs, where Happy performs Ashes To Ashes. A very short (and dark and not great quality) VIDEO of Happy doing the high-to-low bit in "Fame." Here's yet another version, much better-sounding than the ones above. By far my favorite. Listen all the way to the end of the mp3 for some very funny post song banter. For ANNIE LENNOX and/or LORD OF THE RINGS fans. Happy's a HUGE book and movies LOTR fan. This kind of thing certainly would be characterized as “fan-only” because it’s an echoey audience recording from the balcony of a theater. However, it’s one of the very very few times she’s sung any Kate in public (maybe the first time), so thank goodness someone was there to capture the moment. A little setup. This is the 3rd of only 4 shows she did for the release of the album Many Worlds Are Born Tonight. Fans brought a bunch of colored glow sticks and opened them when she went off stage after the last song, before the encore. When she came out for the encore there were all these lights waving (the person recording was laughing in delight at the lights). Her “little light” was completely spontaneous, and I (in the front row) urged her on with a “MORE!” and she did! It’s painfully, painfully short, but I was in heaven. BUT WAIT! Several years later, Happy sings this in full for me at a house concert in Toledo, Ohio! "In heaven" is way too mild a term for how I felt. And a few days later she sang it again. I had brought tiny glow sticks to pass out and after she did her "last" song everyone popped theirs and held them up. Happy asked what they were and I said they were "little lights shining." She didn't, in fact, kick me. Unfortunately I had to take this down because someone put this on autorepeat instead of just downloading it. A few times is more than fine, but this was being played hundreds of times a month. I'll be more than happy to share this with Bee Gees fans, but you're going to have to write me to get a copy (make note of the address because you'll have to manipulate it before it'll work). If you just want to hear(see) it, here is the VIDEO. Happy Rhodes live – Immortality (this is very echoey, definitely fan-only, but I include it because it really is a beautiful song. If she hadn't said, I never in a million years would have guessed it was a Bee Gees song. I guess that says more about how much I don't know about the Bee Gees than the group or the song. It was a pleasure to hear. The very end cuts off so I faded out. For CROWDED HOUSE fans, Happy has a wonderful cover of "Don't Dream It's Over" on the Left Hand Demos but she wanted me to take it down because of legal fears. If you'd like to hear it, write me (note the address, you have to do something to make it work) and I'll be happy to send it to you. In 2001, Happy badly cut her fret hand before an EctoFest concert in the San Francisco area. She later had to have surgery and we were all biting our fingernails about whether or not she’d be able to play guitar again. Happy is, let’s face it, an obscure, unknown artist with a teeny tiny little following. She has a day job and no heath insurance. When word got around that maybe Happy could use some help (it did NOT come from her either), people on the mailing list Ecto pitched in and sent her donations to help pay the medical bills. Happy is loath to take charity (unless it came from Bill Gates, are you reading cherie? ), so as a thanks, she put together 7 unreleased (never to be released) songs and called the compilation the “Left Hand Demos.” A fan from Ecto burned CDs and sent them out to anyone who wanted one. No donation was necessary, but encouraged (by fellow Ectophiles, not Happy). The project has long since been abandoned, so no more CDs are being or ever will be made. Ever. At all. I offer these songs to anyone who perhaps didn’t get in on the project (and some people then did fall through the cracks or didn't hear about it until it was over). Here's Happy's account of the accident from her journal. A very interesting read. If you download them, please give some thought to hopping over to Happy’s web site and buying one or a couple or a few of her CDs. The money goes directly to Happy, and will help her with expenses toward her 11th album, now being recorded in bits and pieces as she gets money to finish tracks. Just in case I need to say this, I’m not doing this at the behest of Happy. She has no idea. I’m just a greedy (for the music) fan who wishes I were a billionaire so I could buy her a freaking studio already so I can get music quicker. It’s been 8 years since her last album, but unlike some people we know and love, taking long breaks between albums is not by choice. To those new to Happy, please keep in mind that she never intended these to be “officially” released on anything, anywhere. Personally, I think they’re all great, but nits could be picked. You are welcome to the music regardless. If you want to help but cannot afford to help monetarily, pass something of Happy’s on to someone else who might like it (...). Spread the word. Any support is welcome and appreciated. This is about the passing of Freddie Murcury. I’m sure there are many songs on this topic. I know of at least one and it’s much better than mine. I never considered this one for release. A 1997 live recording from the Tinker Street Café in Woodstock, NY (that café has since closed down). This is my “artist GOOD – music label BAD” song. I hope to never have another. Thanks to some very sound advice, this one is NOT a consideration for future release. Now You know why they call these “demos.” Glad I never released this one, but it had a specific purpose in the moment. I seriously tried to re-work this one for the upcoming release (this is the first draft). However, it just didn’t work. 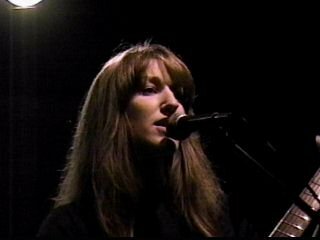 Another live version from the same night at the Tinker Street Café in 1997. Unfortunately, the sentiment was stronger than the composition. I was shooting for something, but never got there. Cover Design by J’te and Dudley, F&B cover photos by J’te. CD producton and distribution by Crew Ecto: Jeff Wasilko, Phil Hudson. When Happy released her 1st 4 albums on CD, until then only available on handmade cassettes, she reworked a couple of songs. “Dreams Are” only got snipped a little bit, but I include it here anyway as one of those fannish “completist” things. “The Chase” on the other hand, was drastically chopped, from 8:12 to 4:22! Prior to the chop job, it was dreamy, repetitive, hypnotic and languid, in the tradition of “To Be E. Mortal” and “Dreams Are” – here is the original. Kevin Bartlett, owner of Aural Gratification, the label that released Happy’s first 9 albums, is a brilliant and prolific musician himself (he started AG as an outlet to release his own work). Why he isn’t famous is beyond me. Happy added vocals to 2 tracks of his. These are ripped from old and well-played cassettes because they’ve never been released on CD. I tried to do a bit of noise reduction on them, and they sounded more "muted" and thinner. I decided to leave them alone. These are in reverse chronological order. If you have an interview not listed here, I don't have it. Pleaaaaaase give me a copy! I only have transcripts for a few of these. Yeah I know, superfan here, and no transcripts? Gasp. I hate transcribing interviews. They're all well-worth transcribing because Happy says some amazing things, but oh my god is it tedious work. Any volunteers? The above is not a full interview in that only a couple of questions were asked. However, Happy performed 3 songs live in the studio. An amazing multi-part interview, with album music. Since it's so long, I've separated it into several parts. One of the best interviews ever! This was conducted with Ectophile Meredith Tarr for her radio show Champaign Jam. This was the day the "1st4" cassettes were re-released on CD. Happy performed 3 songs in very different incarnations from the album versions in this first interview. Here is 1) the full interview with the songs, 2) the interview without the songs, and 3) the three songs as separate pieces. The separate songs were taken from a cassette dub gotten directly from Happy, so there are sound effects that aren't in the interview versions. This interview is the earliest I have. This was done when Happy was still part of the musical duo Bartlett/Rhodes. That's it, that's all I have. I know there are several more. Please, oh please, oh please. For posterity, you know? These songs are on Jeff Oster's album, called RELEASED. "Haleakala" is now available on his EP At Last which features another song Happy sings on, "Matt's Mood." Between Ecto and Warpaint, Happy and Kevin Bartlett teamed up as Bartlett/Rhodes. They never released anything publically at the time, but did have this 4-song demo cassette floating around. At some point I will have better-sounding copies made. This is what I have for now though. A good-sounding version of another Bartlett/Rhodes song, "Be Careful What You Say" (written by Happy Rhodes) was put on the CD version of Rearmament as a bonus track. Charlotte Martin covered Happy's "100 Years" three times that I know about. Once in Chicago and once in Philadelphia at the World Cafe in 2005, and, I believe, once in Florida, though I don't know when. This was an intro to the amazing song "Steel" but the battery ran out on our recorder and we couldn't get the whole thing. If you have any questions, I may or may not be able to answer them, but I'll try. You can write me at xenussister@TAKETHISOUTTOMAILyahoo.com (note: you'll have to manipulate the address before sending it, or it'll bounce back to you. Look at it closely).